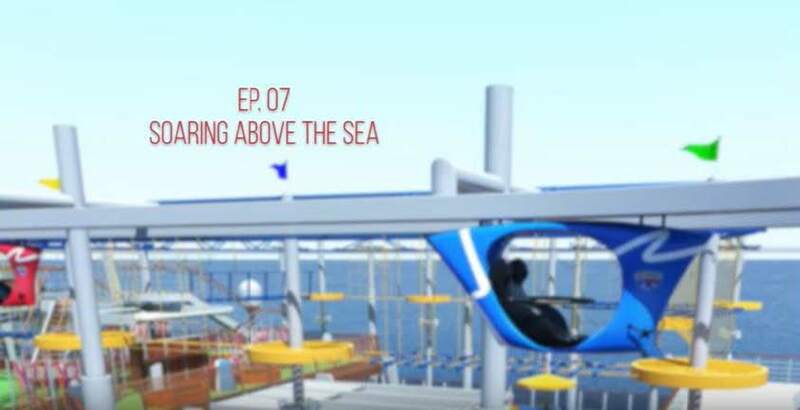 The latest in the Behind the Scenes: Carnival Vista video series goes to new heights – literally – focusing on a groundbreaking aerial attraction called SkyRide, which will make its seagoing debut when the massive 133,500-ton ship enters service in May. Host Peter Gonzalez takes viewers on a virtual tour of the first-of-a-kind shipboard activity in which adventure seekers pedal hanging recumbent-like cycles at speeds of up to 25 miles an hour across an elevated 800-foot-long track, all while enjoying panoramic views of the sea. There will be no charge for SkyRide. Gonzalez also ventures to Waconia, Minnesota, where he interviews SkyRide inventor Scott Olson who also created the first Rollerblades. Olson developed SkyRide as a fun activity for landside amusement parks and worked with Carnival engineers to bring the attraction to the sea. Gonzalez also interviews Matteo de Stauber of the Fincantieri shipyard, where Carnival Vista is being constructed, who discusses the unique challenges of constructing SkyRide in a shipboard environment. SkyRide will be among the many exciting open-air amenities featured aboard Carnival Vista which will also offer the 455-foot-long Kaleid-o-Slide, the line’s longest water slide to date, as well as the SportSquare recreation area with a suspended ropes course, basketball court, mini-golf course and more. Carnival Vista is set to debut May 1 with a 13-day cruise from Trieste, Italy, part of a schedule of Mediterranean voyages through October. The ship then repositions to New York for a pair of voyages then shifts to Miami for year-round Caribbean sailings beginning in November.